We’d love your help. 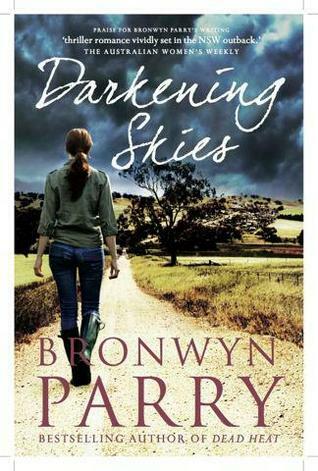 Let us know what’s wrong with this preview of Darkening Skies by Bronwyn Parry. Award-winning investigative reporter Jennifer Barrett never planned to return to Dungirri, the dying town she’d escaped at seventeen. But the shock resignation and startling revelations of local Federal MP Mark Strelitz have reopened the police investigation into the long-ago accident that killed her cousin, and Jenn is determined to find the truth, even if it proves that Award-winning investigative reporter Jennifer Barrett never planned to return to Dungirri, the dying town she’d escaped at seventeen. But the shock resignation and startling revelations of local Federal MP Mark Strelitz have reopened the police investigation into the long-ago accident that killed her cousin, and Jenn is determined to find the truth, even if it proves that the close friend of her youth has become just another politician with a convenient case of amnesia. For eighteen years, the hole in Mark Strelitz’s memory has concealed the truth: that he was the driver of the car in which Paula Barrett died. The investigation was corrupt, another man framed and sent to prison, and now Mark needs to set things right, whatever the personal cost. To ask other readers questions about Darkening Skies, please sign up. Eighteen years ago Jennifer Barrett's cousin and best friend, Paula ended up being killed in a car accident. The day after the funeral Jennifer left Dungirri and promised herself never to come back. But that promise was being broken as she found herself heading back to Dungirri. Jennifer's job as an investigative reporter kept her days busy and very little time to herself, which meant she had slight contact with family. When local Federal MP Mark Strelitz resigned from his position he requested t Eighteen years ago Jennifer Barrett's cousin and best friend, Paula ended up being killed in a car accident. The day after the funeral Jennifer left Dungirri and promised herself never to come back. But that promise was being broken as she found herself heading back to Dungirri. Jennifer's job as an investigative reporter kept her days busy and very little time to herself, which meant she had slight contact with family. When local Federal MP Mark Strelitz resigned from his position he requested that the police reopen the case on Paula's accident. But of course reopening the case could cause a great deal more trouble than Mark or Jennifer had bargained for. Will their lives be in danger and will they find out the truth about the accident? Another fabulous read by Aussie author Bronwyn Parry. Darkening Skies is the third book in the Dungirri series and it really is a gripping read which I completely loved. Recommended. Darkening Skies is book three of the Dungirri series by Bronwyn Parry. Investigative journalist Jenn Barrett did not intend to return to her hometown until Mark Strelitz open up the investigation into the death of her cousin Paula. Jenn Barrett and Mark Strelitz needed answers and to find justice for Gil and Paula, they started to investigate. However, Mark Strelitz and Jenn Barrett did not realise how badly someone wants to keep the truth about the death of Paula buried until people started to Darkening Skies is book three of the Dungirri series by Bronwyn Parry. Investigative journalist Jenn Barrett did not intend to return to her hometown until Mark Strelitz open up the investigation into the death of her cousin Paula. Jenn Barrett and Mark Strelitz needed answers and to find justice for Gil and Paula, they started to investigate. However, Mark Strelitz and Jenn Barrett did not realise how badly someone wants to keep the truth about the death of Paula buried until people started to die. The readers of Darkening Skies will continue to follow the twist and turns in Mark Strelitz and Jenn Barrett investigation to find out the truth about Paula's death and see if they survive. I enjoyed reading Darkening Skies. I love the way Bronwyn Parry portrays her characters and entwines them throughout Darkening Skies. Darkening Skies is well written and researched by Bronwyn Parry. I find Bronwyn Parry books are easy to read and they always the plot and the settings engage me. The readers of Darkening Skies will see what corruption and criminal activities can affect a small rural community. Also, the readers of Darkening Skies will learn about living in a rural community and how they come together in a time of need. Jenn Barrett had been away from Dungirri for eighteen years, ever since her cousin and best friend Paula had been killed in a car accident. She left Dungirri the day after Paula’s funeral, vowing never to return. But here she was, driving in the December heat toward Dungirri, tense, nervous and wondering just what she was doing and why! Jenn had made a good life for herself – as an investigative journalist reporting throughout the world, she was always busy, always trying to beat a deadline – sh Jenn Barrett had been away from Dungirri for eighteen years, ever since her cousin and best friend Paula had been killed in a car accident. She left Dungirri the day after Paula’s funeral, vowing never to return. But here she was, driving in the December heat toward Dungirri, tense, nervous and wondering just what she was doing and why! Jenn had made a good life for herself – as an investigative journalist reporting throughout the world, she was always busy, always trying to beat a deadline – she had had very little time to keep up with her family back at home. Apart from a few scribbled notes to her Uncle Jim, she had kept in touch with no-one. But when Mark Strelitz resigned his position as local member of Dungirri, it made the news – especially as he requested the police reopen the investigation into Paula’s death – Mark had been seriously hurt in the accident, and had a complete block of memory from that time. He couldn’t remember any of it, and now it seemed he had been driving the car all those years ago – Gil Gillespie who had spent time in prison had had his name cleared – Mark wanted answers, and he was determined to set the record straight. But at what cost? It seemed as soon as Mark’s announcement hit the airwaves, chaos began. When attacks on Mark and Jenn occurred and people were being murdered before they could talk, the danger to everyone involved in the dreadful accident eighteen years ago was immense. With the local police, police from areas further afield, SES plus the FBI involved, they all realized someone wanted to keep the past buried deep! No secrets were allowed to be told, and if the killers had their way, Mark and Jenn would not live to tell any tales. I thoroughly enjoyed Aussie author Bronwyn Parry’s third in the Dungirri series. Murder and mayhem; strength of character; deep and intense; this was a book difficult to put down. The romance threaded throughout was only hinted at until almost the end of the book, and there was definitely more suspense and gripping thrills than the previous books… Bronwyn Parry is an author who is immensely popular, and I can't wait until her next book! Darkening Skies is a book I have no hesitation in recommending highly. Fabulous story - Bronwyn Parry never lets you down! Another great story, of life, love, murder and intrigue in an outback NSW town of Dungirri. Bronwyn Parry captures the heart and soul of outback towns and builds the suspense to very satisfying conclusions. Jennifer Barrett a news journalist left Dungirri 18 years ago after the death of cousin Paula in car crash she left the day after the furenal she now returns to Dungirri after Mark Sterlitz Fedral MP resigns after revealing it was him driving the car the night of the accident and not Gill Gillespie and wants police to investigate the accident as he has no memory of the accident as he was seriously injured. Jenn is back for not only back to Dungirri for answers but she is taking a break from her Jennifer Barrett a news journalist left Dungirri 18 years ago after the death of cousin Paula in car crash she left the day after the furenal she now returns to Dungirri after Mark Sterlitz Fedral MP resigns after revealing it was him driving the car the night of the accident and not Gill Gillespie and wants police to investigate the accident as he has no memory of the accident as he was seriously injured. Jenn is back for not only back to Dungirri for answers but she is taking a break from her work to see her family and friends. But Jenn and Mark soon find the lives in danger as police officers Steve Fraser and Kris Mathews investigate the fire at Mark's home which Jenn's uncle Jim is murdered. Photos appear of women being sexually assaulted in the 1970s. Mediocre I’m afraid I did not enjoy this novel as much as two of her others that I have read. Every implausible death, murder, explosion, etc seemed to happen in the town where this story was set. Similar to how everything happened in Mt Thomas from Blue Heelers (the tv show). So enjoyed this series!! Lovely to read and make the connections between the stories. Loved the setting of the book but organised crime just isn't my thing. Wow!!!! What can I say? I have been following this author since As Darkness Falls came out and yet again Bronwyn Parry has delivered a completely enthralling book. I was so excited when I won a copy of Darkening Skies. I was waiting on tender hooks because this author always delivers a fascinating story and if I hadn't won there was no way I was going to miss out on this book. As soon as I started reading this book, it was like I had only finished Dead Heat yesterday. The characters welcome you Wow!!!! What can I say? I have been following this author since As Darkness Falls came out and yet again Bronwyn Parry has delivered a completely enthralling book. I was so excited when I won a copy of Darkening Skies. I was waiting on tender hooks because this author always delivers a fascinating story and if I hadn't won there was no way I was going to miss out on this book. As soon as I started reading this book, it was like I had only finished Dead Heat yesterday. The characters welcome you back as if you had just stepped out of the room for a minute or two. The town of Dungirri stays with you long after you move on and read other books. But don't think you need to read the others before reading this book. They are all based in the same town and the characters sometimes cameo in another book but each book is stand alone. From the beginning in As Darkness Falls when we first see Mark, I wanted to know more about him. Perhaps its because as I've gotten older I've come to realise what people let you see of them isn't necessarily who they really are and Mark came across as a really strong secondary character with hidden depths. With our Federal election just over and all the shenanigans that were involved, for Ms Parry to portray her political character the way she did with Mark is a breathe of fresh air. Here we have a man with strong beliefs of what is right and wrong and who is prepared to stand by those convictions regardless of the personal cost. That when he discovers a wrong, he has to make sure its put right even if to others "what's past is past". Jenn and Mark share a past that should have driven a wedge so completely between them that there should be no coming back from however the author lets each character grow to their own conclusion. They are in many ways completely opposite but as the book flows you really see why opposites attract in a good way. They complement each other and as a couple are so much stronger than each one is alone. This is probably the most fast paced of all the books so far and there really seems to be so many threads to weave you wonder how it all will come together. Right through out the read I was reassessing who I thought the culprit was. Just when I thought I had it worked out, I'd read something and then I was right back at square one. I liked Jenn as a character but this book for me was all about Mark. His strength of purpose, his understanding of himself and his town in touching. Here is a man who doesn't push himself forward. He sees what needs to be done and sets out to do it. Simple actions like putting sugar in the coffee for shock. Or listening to harsh messages on his voice mail so he can reply. Something most of us would just hit delete and pretend it never happened. I remember thinking that in As Darkness Falls, he came across as brash and a bit full of himself but now all I can do is admire him. If there is one book you have to read this year, let it be this one. Ms Parry is one of the few authors who to coin a phrase from "The Castle" go straight to the pool room. Her timing and delivery never goes over the top or falls short. Just when you think there is too much, the thread start to weave themselves together and you find yourself slowing down. Not because of the pace of the book but because you know the end is coming and really, you don't want to leave just yet. Hey who am I kidding, I never want to leave. Darkening Skies is the third (and hugely anticipated) book in the Dungirri series by Australian romantic suspense author, Bronwyn Parry. Each book focuses on a new hero and hero and in this one, its investigative journalist Jenn Barrett and teenage sweetheart Mark Strelitz. Jenn Barrett escaped the small town of Dungirri when she was an adolescent, following the tragic accident that resulted in her cousin’s death. She set her feelings for Mark aside and moved to the city where she was able to bu Darkening Skies is the third (and hugely anticipated) book in the Dungirri series by Australian romantic suspense author, Bronwyn Parry. Each book focuses on a new hero and hero and in this one, its investigative journalist Jenn Barrett and teenage sweetheart Mark Strelitz. Jenn Barrett escaped the small town of Dungirri when she was an adolescent, following the tragic accident that resulted in her cousin’s death. She set her feelings for Mark aside and moved to the city where she was able to build an exciting and varied career in journalism. Dungirri is home for Mark, who’s made a career in politics. But when he discovers he was the driver and that a young, troubled teen (Gil Gillespie) was framed for murder, he resigns from his employment and makes a public declaration of his guilt. This is the catalyst for Jenn returning to Dungirri and it’s also the start of a perilous investigation into the series of murders occurring in the small town following Mark’s admission. Jenn and Mark are reunited in Dungirri, thrust into an adrenaline bursting scene where a man’s life is at risk. Past hurts and the separation between them is momentarily forgotten until the adrenaline wears down and they are both faced with the reality of their current circumstances. Jenn has conflicted feelings for Mark, who claims he was the driver of the accident that killed her cousin, but she can also see that the evidence isn’t quite adding up. Is Mark really a murderer? It quickly becomes obvious that they are wrapped up in this investigation together whether they like it or not and their former bond is reinforced amidst the life-threatening situations they face each day. From conspiracies to secrets to betrayals and a surprising underground crime ring, Darkening Skies is a worthy addition to the Dungirri series that is easily one of my favourites in the genre. Parry predictably delivers an unthinkable amount of trials and tribulations in the way of her hero and heroine and as a reader, you just have to trust that they’ll come out the other side stronger, emotionally intact and able to have the happily-ever-after that is expected of a romance. Of course, even once all the dramas have settled down, Parry still makes the reader wait for that HEA… this book is not short of tension. If romantic suspense and small town dramas are a guilty pleasure of yours, then pick up a copy of Darkening Skies. I've been looking forward to reading Darkening Skies by Bronwyn Parry for some time. It's the third in a series of creations set in the fictional Australian town of Dungirri. The preceding books, As Darkness Falls and Dark Country, both proved wonderful adventures into a disturbingly sinister underside of a sleepy rural, declining town. The author has a talent for describing a calm, realistic, environment that could be many places. Where future generations leave for the city to pursue further edu I've been looking forward to reading Darkening Skies by Bronwyn Parry for some time. It's the third in a series of creations set in the fictional Australian town of Dungirri. The preceding books, As Darkness Falls and Dark Country, both proved wonderful adventures into a disturbingly sinister underside of a sleepy rural, declining town. The author has a talent for describing a calm, realistic, environment that could be many places. Where future generations leave for the city to pursue further education and in doing so render themselves unemployable `back home.' Where the main street is littered with vacant shop fronts and aged faces feed upon nostalgic tales of a grander past. Where the future belongs to children of modest, formally uneducated, seasonal workers who have nowhere else to go. Where former residents, who make good, are more important to the town than the town is to them. And where a sense of hope, of belonging in the community and everyone knows their neighbour is alive and vibrant. With this image painted in the readers mind Ms Parry unravels her plot, a story of intimidation, destruction and untimely death on a grand scale. Where people stay quiet, and conform, or go under and only the foolhardy dare pursue truth and justice. Jenn Barrett, a respected journalist and former resident returns to Dungirri looking for answers. Jenn seeks out Mark Strelitz, a former close friend, popular local politician and seemingly well-informed local. Together they agree to dig up the past, an innocent yet tragic car accident with twiddled statements of fact to create a cleaner truth, or so it would seem. Yet as this story unfolds Jenn and Mark discover the so-called accident `cover up' merely buries the keys to a graveyard of corruption and injustice that is sown into the very foundation of this `quaint,' sleepy town. The truth might destroy and someone is prepared to do just that to keep the story buried. Who? (I received this book for free as part of Goodreads First Reads giveaways). I quite liked this book, though it did take me a little while to get into it. I was a bit confused over some of the characters at first, but I quickly settled into the plot and was able to empathise with a lot of the characters. I really liked the concept of someone being wrongfully accused for a crime he didn't commit, but I would have liked to see more at the end with Gil. I liked Jenn a (I received this book for free as part of Goodreads First Reads giveaways). I liked Jenn and Mark's relationship. It didn't overshadow the mystery and the mystery didn't overshadow the romance. However, although some of the things were a bit surprise, the ultimate culprit wasn't much of a twist - it was already mentioned and not really vetoed. I did like how everything ended up fitting together at the end, but I thought that Jenn's decision to return seemed a little rushed. I think a bit more of the book should have been devoted to her realising what she really wanted to do. The supporting characters were interesting and well-rounded enough to make me interested in reading other books by this author. I'd particularly like to read the background to Gil and Kris' relationship. Plus, I'd like a bit more of an insight into those characters. I've looked forward to reading Mark's story for some time and after this, I'm convinced that Bronwyn Parry can do no wrong - especially on the mystery/crime front. As usual, the suspense far outweighs the romance bit, which is a thin, loose thread of teenage lovers reunited as adults deftly woven into a deepening mystery surrounding Mark’s sudden resignation after a life-defining event that happened 18 years ago. Held back by not-too-pleasant memories and issues that stretch farther than their o I've looked forward to reading Mark's story for some time and after this, I'm convinced that Bronwyn Parry can do no wrong - especially on the mystery/crime front. As usual, the suspense far outweighs the romance bit, which is a thin, loose thread of teenage lovers reunited as adults deftly woven into a deepening mystery surrounding Mark’s sudden resignation after a life-defining event that happened 18 years ago. Held back by not-too-pleasant memories and issues that stretch farther than their own insecurities, Jenn's and Mark’s burgeoning relationship is toe-curling, delicious and painful to read. There’s plenty of their hyper-awareness of each other given their complicated history but the fulfilment of their passion seems to pass us by, briefly mentioned by Parry in a short love scene in the closing pages of the book. I’ve always loved Parry’s male leads and Mark is really not too different from the other heroes in her books - masculine, principled, effortless with words and so multi-faceted that I’ve (un)consciously used them as benchmarks for assessing other romantic leads. Jenn is no pushover either; her tendency to run scared and over-question issues, while annoying at times, is at least clearly acknowledged and compensated for in the ending. Wow! what a story. Got the book from the local library and I haven't read the books in sequence but a Detective from the previous book is in this story. Everything just escalated in less than a week with killings, explosions, finding people, and love that could find its way from the past to the present. The book certainly had you going back pages to re-read so you can keep up with the fast happenings. I am just amazed how the story developed in the authors mind. A bit different with all the twists and turns, just the right amount of tension from the characters and the interwoven links from the past that come back to haunt more than just the main characters. Well worth a summer read - probably an oldie but you don't know what you find here on Australian bookshelves. Thank you to my mother-in-law! Intriguing characters and skilful writing bring together a gripping story of a small town in crisis. Another great read from a talented Australian author...I'm hoping Steve Fraser's story is next! Easy and very enjoyable mystery suspense. I loved the outback setting. Just as good as book 1 and 2. Great to be back in Dungirri and become engrossed in both Mark and Jenn's stories. Fast paced and full of intensity and building romance. A good story but a disturbing amount of deaths for a small country town. I grew up surrounded by books, and have a love of reading and stories. Commercial fiction, literary fiction, children’s literature, history – my bookshelves are forever overflowing! I write gritty romantic suspense, set in Australia's wild places. My six novels and a novella are in two loosely-linked series, but each book stands alone and is a full story. I live on 100 acres of beautiful bushland I grew up surrounded by books, and have a love of reading and stories. Commercial fiction, literary fiction, children’s literature, history – my bookshelves are forever overflowing! I live on 100 acres of beautiful bushland in the New England Tablelands of NSW, Australia, with my husband and three border collies, and I love to travel in Australia's wild places.